The Maritime Aquarium at Norwalk is seeking citizen-scientist volunteers who will be … hoppy to help with a census of frogs in their neighborhoods. 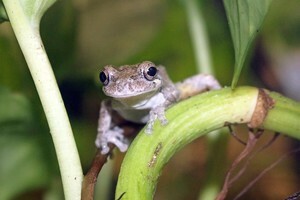 An army of trained volunteers is needed to provide local data to a national program called “FrogWatch.” The local effort is a collaboration between The Maritime Aquarium, Connecticut’s Beardsley Zoo in Bridgeport and Yale’s Peabody Museum in New Haven. Although it’s called “FrogWatch,” volunteers will be asked to frog listen, not to watch. You don’t have to know anything about frogs and their different calls to sign up. That will be taught during upcoming training sessions at each of the four local institutions. “FrogWatch” volunteers must commit to make regular visits to a wetlands in their neighborhood once or twice a week for about 15 minutes this spring and summer, beginning each night a half-hour after sunset. During these listening sessions, volunteers are asked to record the different kinds of frogs they hear making calls. Kids can help, but older children are recommended because, in summer, a half-hour after sunset can be after 9 p.m.
Data collected in Connecticut goes into a national database that helps with amphibian-conservation efforts. The trainings are free to members of the three organizations, or $10 for non-member families. • Sat., March 2 from 2-4 p.m.
• Fri., March 8 from 7-9 p.m.
• Fri., March 22 from 7-9 p.m.
Each session has a snow date. Advance registration is required for the trainings. Sign up and get more details at www.maritimeaquarium.org/citizen-science.